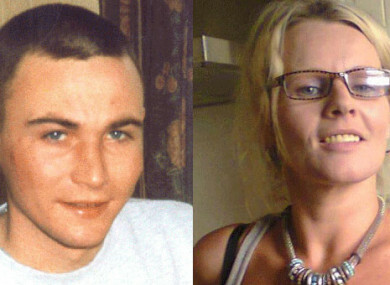 Finbar McGrillen and Caron Smyth were murdered on 12 December 2013. THE POLICE OMBUDSMAN for Northern Ireland has criticised police over the release of a man who had been arrested for assaulting his partner and who then went on to murder the woman and her friend three days later. In a report published this morning, Dr Michael Maguire concluded that had a more appropriate course of action been taken by police, it may have reduced the likelihood of what was to happen. The bodies of Caron Smyth (40) and Finbar McGrillen (42) were found on 13 December 2013. It is believed they had been murdered by Sean Hegarty and another man the previous morning, sometime between 4am and 7am. Police had Hegarty in custody several times that year, including during the weekend prior to the murders, when it was alleged he had assaulted Caron. Sean Hegarty had a lengthy criminal record, with more than 70 convictions and several allegations of abuse of previous partners. He had been categorised on police systems as a ‘violent offender’. In January 2013, police had a report that during a burglary he had assaulted a home owner with a hammer. In early April, they received a report that he had assaulted a man in Strabane. Later that month, he was given a prison sentence for assault on a former partner the previous year. Prior to his release, a Protection Panel meeting concluded he could cause serious harm by carrying out a sexual or violent offence. In May 2013, he was released from prison and during that summer he started a relationship with Caron, who lived at Drumaness in County Down. In June, police received a report he was in a premises in Belfast threatening to kill a former partner. Also that month they received a report that he had assaulted a relative, cutting the man’s face with a knife. In July, they received reports that he had made a threatening phone call to an ex-partner and had threatened a woman with a knife. In October, he was arrested for his alleged involvement in the knife attack on his relative and was released on court bail. The conditions of Hegarty’s bail were that he live at Caron’s home, not go out between the hours of 10pm and 7am, be fitted with an electronic tag to monitor that he keeps curfew and present himself at the door of the property if asked by police or the monitoring system which operated the tagging system. Shortly after midnight on 7 December, police called at the house to conduct a bail check. When no one answered the front door, they left without checking the back door or rear of the property. Officers filed a report that he had breached his bail conditions but took no other action that day. The next day, Caron contacted police to say Hegarty had locked her inside the house since Friday and assaulted her with a metal bar. She told them he had been inside the property holding her against her will when officers called to the door. She managed to escape and went to a relative’s house. Police compiled a report which detailed her injuries and recorded her as saying she was frightened and thought Hegarty was going to kill her. The report concluded that she was ‘at risk of serious harm’. Caron also told police she wanted to withdraw the use of her address as part of Hegarty’s bail conditions. Police arrested him for assault and for breaching those conditions. However, he was released the next day on the condition he did not contact Caron or enter Drumaness where she lived. Without the authority of the court, police changed the location he was to live at to an address in Belfast. This house had no electricity supply to operate his electronic tag. Three days after his release, on 12 December, Hegarty and Ciaran Nugent murdered Caron and Finbar. During the trial, the double murder was described as a savage and sustained attack during which the two victims were punched, kicked, stamped on and cut, BBC reported. The judge said the killings were cruel and utterly senseless and had been initiated by Hegarty’s jealousy and anger. The Police Ombudsman said decision-making which led to Hegarty’s release was flawed, failed to protect the victims and to adequately assess the risk presented by a violent offender. “This was a man who was flagged on police systems as a violent offender and who had breached court bail conditions the previous weekend, when they believed he committed a violent assault,” Maguire said. Police decided to release him to a different address, even though only a court can authorise a change of court bail address. They did not properly check the suitability of this new property: had they done so they would have established it did not have an electricity supply needed to operate the electronic tag. The ombudsman identified one “very competent” officer who “did the best he could”, but six other officers have now been disciplined. Another police officer involved was required to resign in connection with an unrelated matter. Responding to the report today, Assistant Chief Constable Alan Todd said it was “difficult reading”. He acknowledged that on this occasion, police “failed to effectively manage the risk posed to the public by Sean Hegarty”. The Police Ombudsman made five policy recommendations within this report in seeking to help prevent such events happening again and we have accepted these recommendations in full. We have disciplined a number of officers as a result of this case. We are now in the process of addressing some of the issues raised within the report in terms of our systems and processes, such as reminding every officers about their responsibilities when it comes to dealing with bail. Email “Police 'failed' in releasing violent offender who killed his partner three days later”. Feedback on “Police 'failed' in releasing violent offender who killed his partner three days later”.